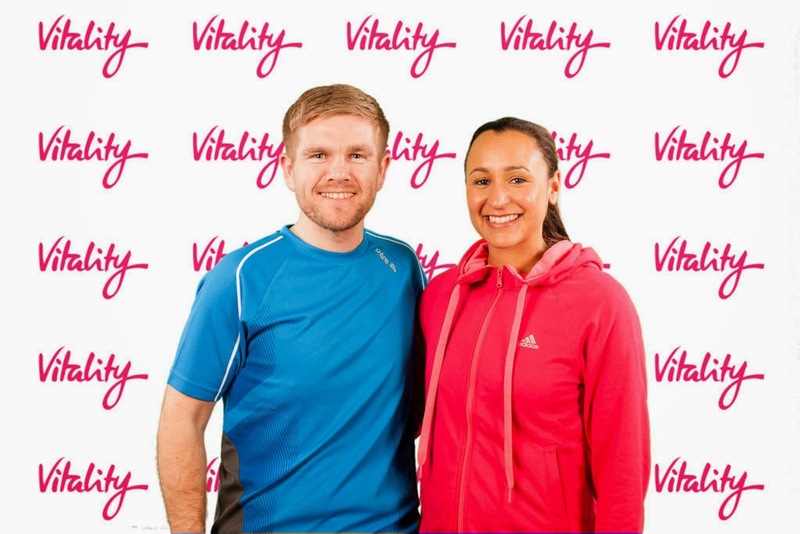 I was recently invited to meet Olympic gold medallist, Jessica Ennis-Hill thanks to PruHealth. 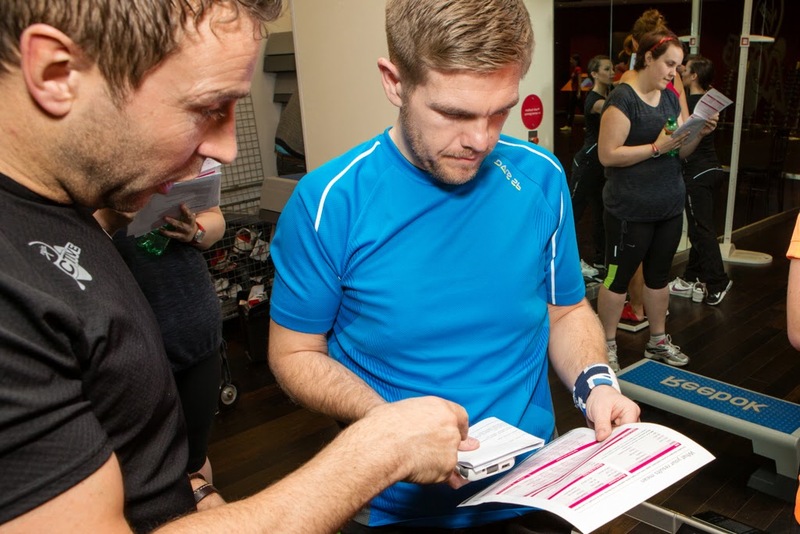 The day was held at the Virgin Active club in Aldersgate Street, London. The gym was underground and much bigger than I was expecting. It was very modern and posh looking. I got there just before 12 and got changed into my new dare2b workout gear. I then sat in the lounge area wondering if the others also sat there were waiting to meet Jessica. The Vitality day was a mix of fitness bloggers and competition winners, about 20 of us in total. One of the bloggers I met was Rebecca who writes about weight loss and fitness from a female perspective. Check out her blog at weightwars.co.uk. At the start we were split in to two groups. My group started off with an introduction to the Vitality product. It's essentially health insurance which rewards you for choosing a healthy lifestyle. We had a talk from a nutritionist who spoke about the basics of nutrition and what foods fit into each category. I was familiar with most of what she said but it was good as it reinforced my beliefs. There was then a selection of healthy foods for us to try and I also got to have a go on a smoothie maker bike. 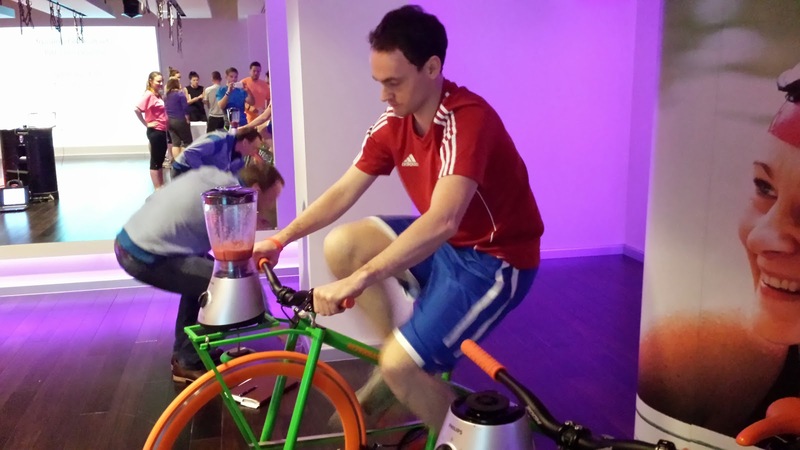 If you've not seen one before, it's essentially a stationary bike that powers a blender. The smoothie was good. Next up was a short talk by Dr Paul Brice, Senior Biomechanist from the English Institute of Sport. He's the one that analyses what Jessica does physically and works out how to make her better. His team films athletes in slow motion to asses where maximum efficiency gains can be made. This can often take the athlete up to 18 months to get maximum advantage though by retraining how they do things. It was a fascinating talk and I could have listened to the subject all day. You can see footage of Jessica in action at London 2012 on the BBC website. It was now time to swap groups. The group I was in went into the next room. It was time for my fitness assessment. I had my height and weight measured so my BMI could be calculated. I had a basic fitness test. I had my blood pressure, glucose and cholesterol tested too. I've never had my cholesterol tested but it came out at 4.10 which I was told is very good. After the barrage of tests (they weren't really that invasive) I had a neck and shoulder massage and then some lunch. I then was interviewed by the PruHealth team for their website/YouTube. We then had a question and answer session with Jess and I couldn't think of anything useful to ask but I did ask her one question.